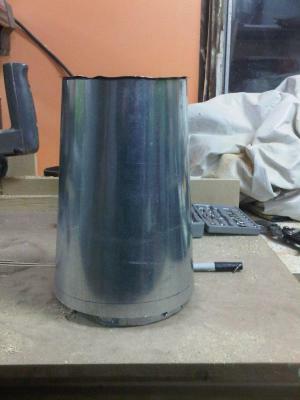 The height of the combustion chamber is not significant. 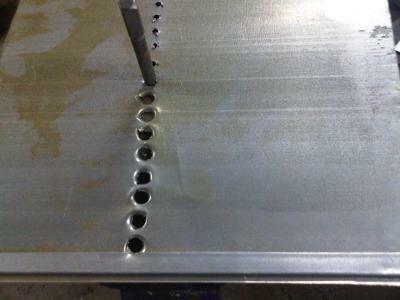 The line of secondary air holes are placed 4 inches (102 mm ) below the top lip. 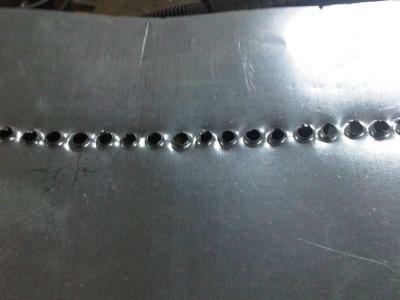 The holes are 5/16" in diameter (8 mm) and are formed by knocking a tapered punch into a small starting hole. 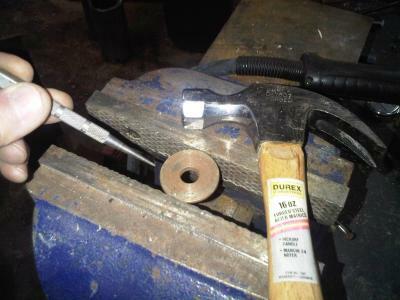 A washer is used to do this. 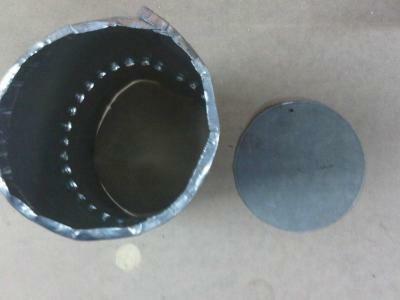 It creates an 'air spout' that blows air into the centre of the chamber. 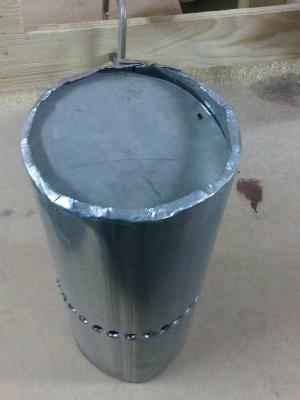 This combustion chamber holds 1 kg of pellets - the top of the fuel must not be higher than the line of secondary air holes. The power is about 2.5 kW. 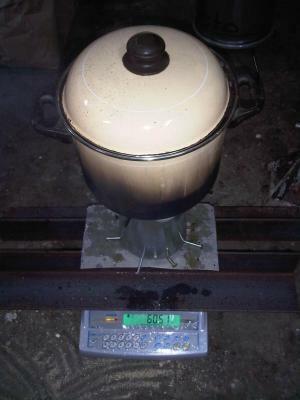 The char remaining after 1.25 hours was 275 g.
The pot being in place creates a sheltered environment that allows the flame to burn much longer and can result in a (visually) clean extinction. 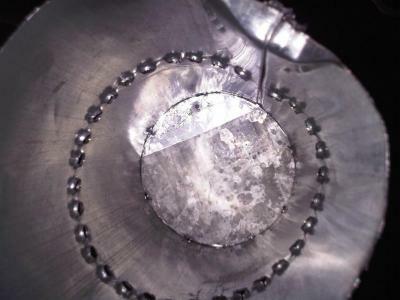 If a disk with a central hole is placed at the top of the combustion chamber, it performs the function of keeping out cold down-drafts into the chamber on one side with flames being chased out of the chamber on the other. 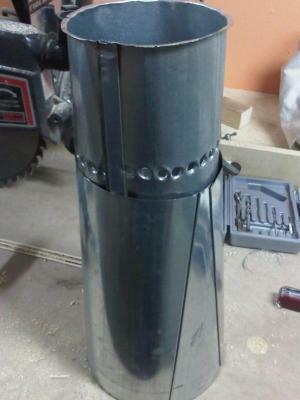 This part is unnecessary with this air supply layout (a Vesto-based design). 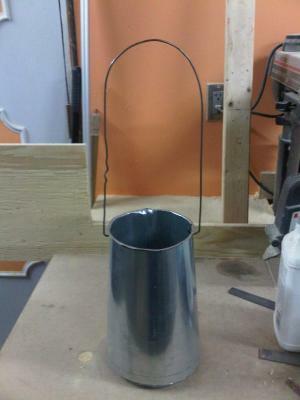 Put on a pot to control the ingress of cold air at the top. 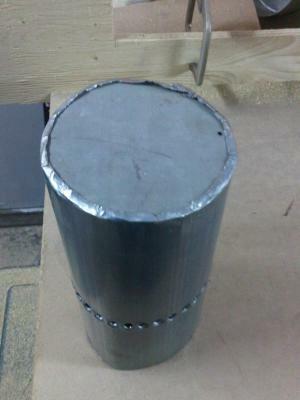 If used as a heater, a perforated place will also do. 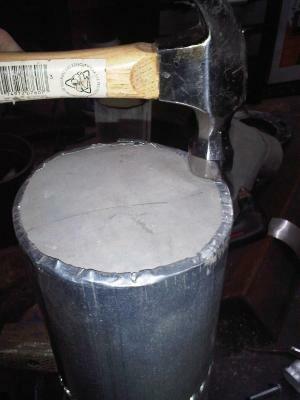 The pot is part of the stove. If the primary air is opened in time (before the volatiles are used) the flame continues for longer, then goes out. There will still be a CO spike at the end but it seems to eliminate the 'smoking phase' at the end. Confirmation still needed. 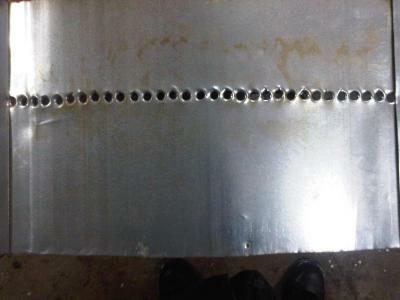 As the char yield was still 27.5% of the initial pellet mass, it cannot be considered Unproductive in terms of char. 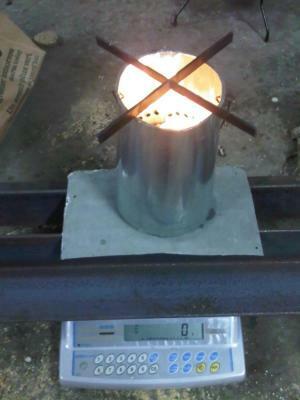 This gives a final heat content for the char of 15.5 MJ/kg, or 4.27 MJ remaining from this burn. 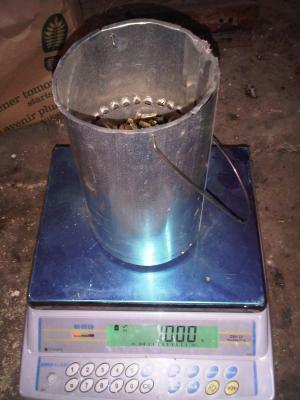 The total yield of heat was approximately 13 MJ over a period of 80 minutes (4800 seconds) for a calculated average power of 2.7 W.
High) using a large pot with >3 litres of ice water in it. 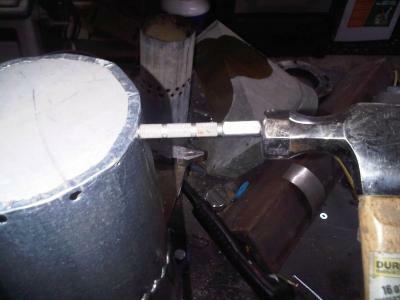 Given the high power in such a relatively small stove, the flames are quite short. This is because there is an adequate but not excessive secondary air injected below the pot so that the flame barely touches the underside. This limits the formation of soot and helps burn Carbon-Monoxide (the blue flame). 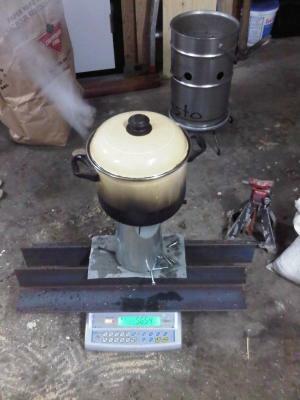 By type, the stove layout has a Tsotso style secondary air pre-heater with Vesto-like secondary air entrance and direction of that air, all with a choked primary air supply. 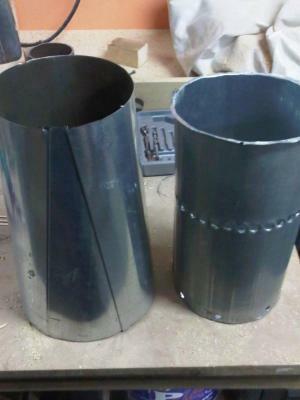 In order to turn it into a Vesto, add a third shell around the outside no higher than the secondary air hole entrance (not the full height of the stove). 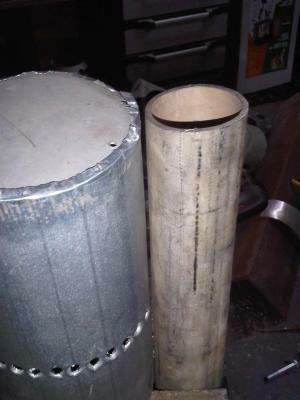 There is no control over the secondary air supply which rises between the outer cone and the combustion chamber within. 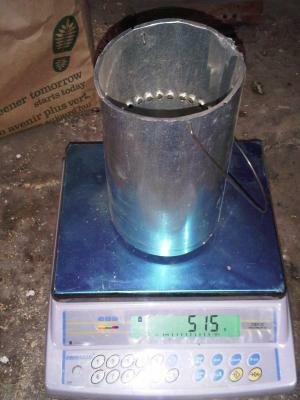 The stove weighs about 500 grams. 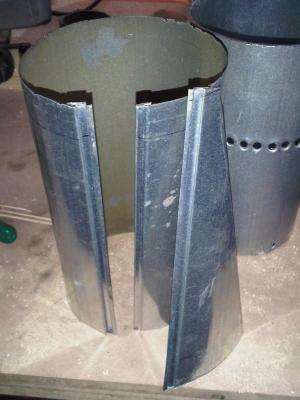 The materials would cost about $1.50 if executed in a low chrome stainless steel such as 3CR12 or SS 430. 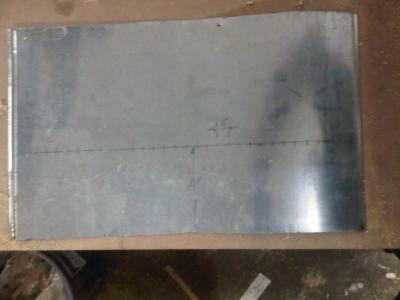 This one is made from scrap 26 and 30 gauge sheet metal. 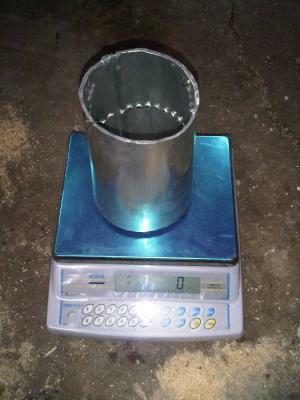 The pot stand is 12 mm high and could be reduced to 10 mm. 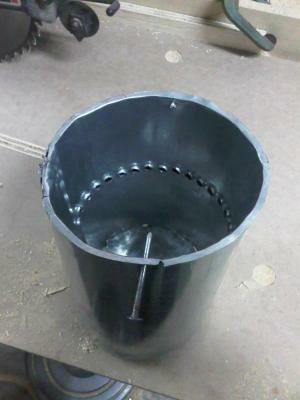 The Grasifier can considered to be a combustor, not a stove. 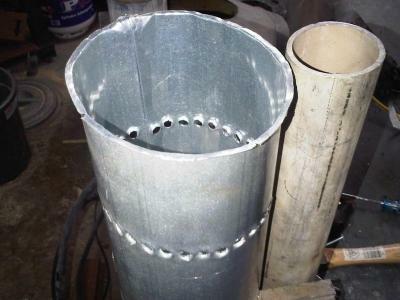 It can be placed into any of dozens of stove bodies such as a Lorena clay stove or any metal or brick constructions that can support the pot properly. 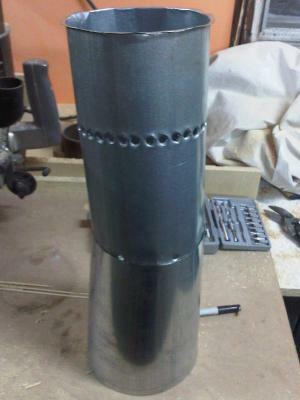 The handle, used to remove the combustor for emptying and re-filling, should be shortened to fold next to the top lip if it is installed in a larger stove body. It can then be removed with a hook.